Salt Lake City is located at the southeastern corner of the Great Salt Lake. The Great Salt Lake has several islands, the largest of which is Antelope Island. Since Antelope Island is located near Salt Lake City, it was a good place for us to see the lake. Antelope Island is a state park with a causeway to the island that starts on the mainland near Syracuse, UT, about 28 miles north of where we were staying. Along the causeway, we saw flocks of gulls. The dark shadows along the shore in the photo below are billions of brine flies. As the gulls walked along the shore or flew a few inches above it, clouds of the flies would erupt, and the gulls would have a feast. We stopped at the visitor center which is located on a rise that affords nice views of the lake to the north and west. The next photo is the 6-mile causeway onto the island. Bridger Bay is on the northwestern corner of the island and is where the swimming area is located. We didn't try it, but swimming is supposedly fairly easy because the high salinity of the water makes it very dense so you float very easily. As we entered the visitor center, we saw dozens of barn swallow nests under the roof overhang. There were chicks in the nests, and the parents were flitting back and forth trying to keep them fed. At the visitor center, we learned a little about the lake. The Great Salt Lake is about 75 miles long and 28 miles wide at the widest point. It has an average depth of only about 13 or 14 feet and a maximum depth of about 33 feet. Because the lake is so shallow the size can vary greatly with small changes in depth, and the changes in depth occur depending on the season and rainfall. At an average area of about 1,700 square miles, the Great Salt Lake is the largest salt lake in the western hemisphere. The salinity varies according to location, rainfall and season, but it can run as high as 25 to 28%, which is 7 or 8 times saltier than sea water. "America's Dead Sea" is the name sometimes given to the Great Salt Lake, but the lake is far from dead. As we saw on our way across the causeway, there are many California gulls around the lake. There are no fish in the lake, but the gulls, along with other migratory and nesting birds, feed primarily on the brine shrimp that live in the water and on the brine flies. In turn, the brine shrimp and brine flies feed on several types of algae that survive in the salty water. The Great Salt Lake is the remnant of a larger, deeper lake called Lake Bonneville that once covered most of Utah. Lake Bonneville had an area of almost 20,000 square miles and a depth of 1,000 feet. In the distant past a significant amount of water was released from Lake Bonneville through Red Rock Pass in southeastern Idaho and ran across the southern part of Idaho. We visited southwestern Idaho in 2008 and saw where the water carved out the canyon where Shoshone Falls is located. To read about our visit to Shoshone Falls and southern Idaho click here. Following the release of the water, warming temperatures after the Ice Age increased the evaporation rate of the remaining water. With no outlet, the salinity of the lake continues to increase. After we left the visitor center, we stopped a short distance down the road at the Lady Finger Overlook. There is a short trail that leads out onto a spit of land that overlooks Egg Island, which is a small island that is a bird rookery. The next photo shows Margery near the start of the trail. The last part of the trail was pretty rocky and pretty buggy. Fortunately, Margery grabbed a packet with a towelette of insect repellent as she got out of the car. It helped. The photo below shows both of us near the end of the trail. And the next photo shows Egg Island off in the distance to the left. We could hear the birds out there squawking. Also contributing to the squawking was a magpie that followed us for a short way. Looking back toward the main part of the island, we could see the mountainous spine of Antelope Island. There are several trails up to some of the peaks, but we decided to pass on the steep climbs. The peaks are more than 1,000 feet above the level of the lake. As we said, Antelope Island is the largest of several Islands in the Great Salt Lake with an area of about 42 square miles. Antelope Island has dozens of freshwater springs, and it is the home to pronghorn antelope, bighorn sheep, coyote, bobcats, badgers, and numerous species of birds. Antelope Island is also home to a herd of American bison. The bison were introduced to the island in the late 1800s. We'll have more about the bison a little later. There is a road to the south that goes about 2/3 of the way down the eastern side of the island. At the end of the road is the Garr Ranch that was started in 1848 by Fielding Garr under the direction of the Mormon Church. He selected that location for the ranch because that was the biggest and most reliable spring on the island. The LDS Church raised cattle, sheep and horses on the island from 1850 until it relinquished possession of the island in 1875. At that time, the Federal Government opened the island to homesteaders. Investors began buying up the land from the homesteaders. By the late 1800s, most of the land on the island was owned by the Island Improvement Company. The company controlled the island until 1972 when it was sold to another company. The state bought up the land in 1981 to make the island a state park. Today, the ranch has buildings and equipment from the 1800s to the later 1900s. The corrugated-metal shearing barn in the photo below was built in the 1920s for one of the largest sheep operations in the west. Over 10,000 sheep were on the island at that time. The barn had a gasoline engine that turned shafts and pulleys to operate 10 mechanized shearing stations. The photo below shows the ranch house. There have been several additions to the house, but the original portion was built in the late 1840s. One interesting piece of equipment was the sheep camp, which could be considered an early RV. Paul was looking for the electrical hookup. Margery found the inside to be...well, let's just say it was cozy. As we said earlier, Antelope Island has a herd of bison that numbers about 600. There were about 40 or 50 of them on the salt flats near the ranch. One of the bison below is taking a dust bath. It is thought the dust helps ease skin irritation caused either from shedding, which was going on at the time, or irritation from insect bites. In the fall, volunteers round up the bison. The bison are checked by veterinarians, they're given shots, and animals are selected for sale to keep the herd to a manageable size. On our way back north toward the causeway and the mainland, we took a short side road part way up the mountain to one of the trail heads. From there we got a great panoramic view of the eastern side of Antelope Island. The photo below is looking to the southeast toward Salt Lake City. We had time for a quick Walmart stop on the way back to the motor home to pick up a few groceries. We relaxed a while, but there is still more to see around Salt Lake City, so look for our next post. We left Page, AZ for a 4 hour drive to Bluff, UT where we stayed at Cadillac Ranch RV Park. Bluff, UT is located in a sandstone cliff-lined valley of the San Juan River. Cadillac RV Park has nice views of the sandstone cliffs, full hookups, and wide gravel sites with small shade trees. The campground was quiet with little road noise. There is a fishing pond lined with benches and lamp posts. Cadillac RV Park was a gem. Not only was the campground nice, there was plenty to do in the area. Once again, we should have planned to stay longer. Bluff City was established in 1880 by a group of Mormon pioneers called to colonize the San Juan River area. Its tall shade trees and several sturdy sandstone homes are an oasis in a stark desert setting. The historic district encompasses most of the original 1880 town site, cemetery hill, and the bluffs north of town. Most of the remaining historic homes were built between 1890 and 1905, and they are of the Victorian eclectic or vernacular architectural style. We drove up the hill to the cemetery one evening. Most of the graves are outlined with cobblestones; there is no landscaping. The winding drive, grave markers of significant artistic and cultural merit, and the panoramic view made this a fascinating place to visit. The hardships endured by these early settlers becomes evident when roaming the cemetery. One marker identified a young boy by name and the additional engraving reading "And Two Baby Girls." Another family grave site showed the death of a 1-day old baby in November and another baby who lived six weeks and died Christmas Eve the following year. What heartache these parents endured. Our main purpose for a two night stopover in Bluff was to see Monument Valley. Monument Valley straddles the border between Arizona and Utah. Although US 163 passes through a portion of Monument Valley, the major part lies within the Navajo Nation Tribal Park. There is a dirt road that winds down around some of the buttes and spires. The road can be accessed from the tribal park for a fee of $5 per person. There are also guided tours available; but these tours are in open trucks and are bouncy, dusty, and hot so we opted to drive the dirt road on our own. The photo below shows two well-known buttes called the Mittens. Monument Valley has been the scene of dozens of movies and TV shows. Director John Ford filmed 9 westerns here including the John Wayne movies "Stagecoach" and "The Searchers." On the way back from Monument Valley, we stopped at Goosenecks State Park. Here, the San Juan River has carved a 1,000 ft. deep canyon where it twists and turns in what is called an entrenched meander. From Bluff, we continued north to the O. K. RV Park in Moab. Some parking pads were gravel, but ours was dirt - and soft dirt at that. Fortunately, it didn't rain while we were there or we would have been up to our axles in mud. Most of the sites have small trees and decent grass between them, but the sites are still pretty close together. Our grass was quite sparse so we put out our patio mat to try to cut down on the red dust. At least the campground was relatively quiet in spite of the empty beer bottles we saw at our neighbor's site. The same empty bottles that were there when we arrived were in the exact same locations when we left 5 days later. On our first full day in Moab we drove into town to the visitor center and then took a short scenic drive up the canyon formed by the Colorado River as it flows into town from the neighboring state of Colorado. This was another addition to Utah's beautiful roadside scenery. The next day, we drove south on US 191 to Canyonlands National Park. Canyonlands is a large system of valleys and canyons that surround the confluence of the Green and Colorado Rivers. The national park is divided into three main districts by the rivers themselves. Island in the Sky District is in the north, the Maze District is to the southwest, and the Needles District is to the southeast. The Maze District is the most rugged and remote and is accessible only by roads suitable for high ground-clearance 4X4 vehicles or by hiking trails. The Needles District is somewhat more accessible with a visitor center, a primitive campground, and a short, paved, scenic road. Island in the Sky is the most accessible district with more paved roads and overlooks. Since the Needles District was the farthest from our campground, we decided to see it first. The photo below shows the Needles, which get their name from the fact that they are relatively sharp, slender columns. On the road into the Needles District is Newspaper Rock, which is a petroglyph panel etched in sandstone. 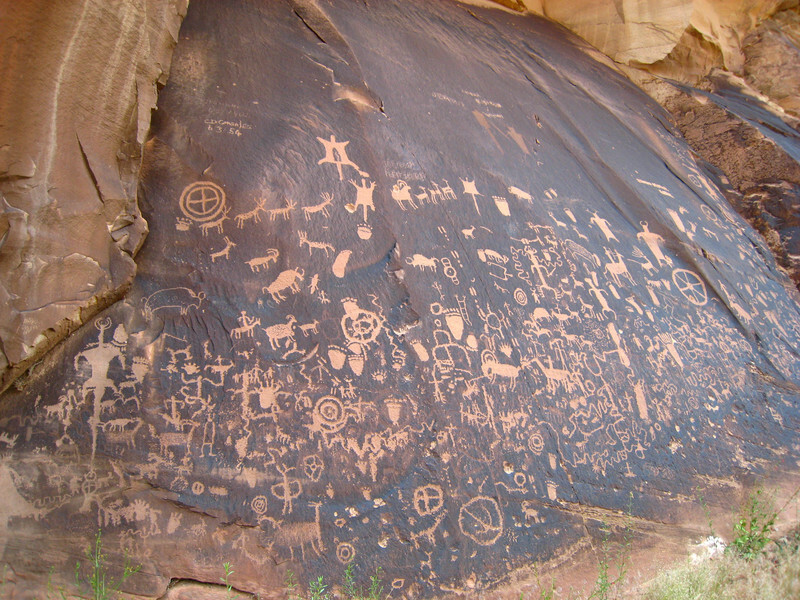 Newspaper Rock records approximately 2000 years of man's history up to about 1300 A. D. There are even some more recent Ute, Navajo, and Anglo markings. Scholars don't know whether the markings were story telling, clan markings, hunting magic, or just graffiti. This triggered a lively conversation about today's graffiti...not only the talent of these artists but also efforts to eliminate it. In the west, trains are a popular canvas for these artists. What will people learn about us from our graffiti? After leaving the Needles District of the park, we drove farther north to the Needles Overlook. This overlook is at the top of the eastern wall of the canyon overlooking the park to the west. In retrospect, we should have gone to the overlook before going to the Needles District because by the time we got to the overlook, it was late afternoon and the sun was shining in our faces. Not only would it have been a better view earlier in the day, it would have given us a better perspective of the overall park before we actually made our first visit. The photo below is looking to the northwest to avoid the afternoon sun. Although this view looks somewhat like the Grand Canyon, it is not nearly as deep. The canyon rim in the distance is Island in the Sky. With a fresh start the next morning, we headed north of Moab to the Island in the Sky District of Canyonlands. Island in the Sky is on a plateau between the Green and Colorado Rivers. 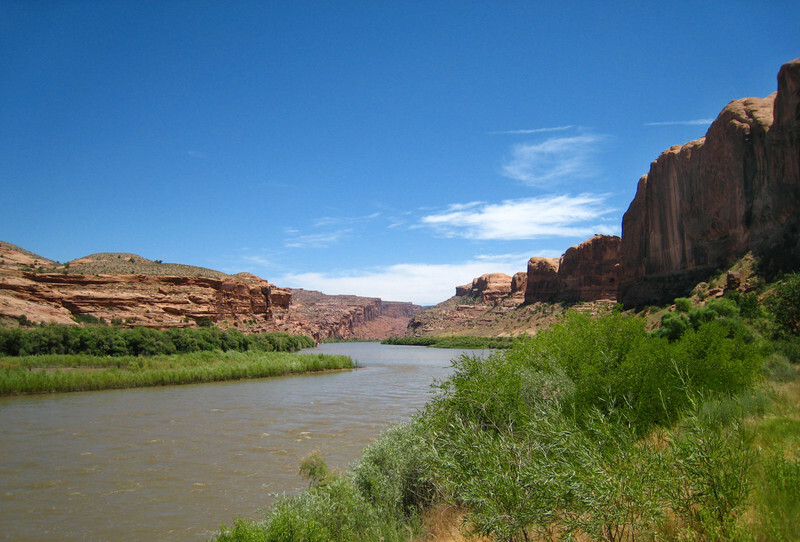 The photo below is a view of the Green River. John Wesley Powell traveled down the Green River as he headed for the Colorado River and its unknown course. In the northwest of the Island in the Sky District is a strange formation known as Upheaval Dome, which is shown in the photo below. Just about everywhere else in this area the rocks are in layers that are relatively flat, but not at Upheaval Dome. Here, the layers are exposed and distorted in a two-mile wide crater-like depression as if they were heaved up. Some geologists trace the origin of Upheaval Dome to the impact of a meteorite. However, other geologists see evidence of a more gradual development from forces below the ground. Beneath Upheaval Dome lies a massive salt deposit which came from ancient seas. Hundreds of feet of rock were later deposited over the salt. The salt theory says the salt, which can become plastic under pressure, forced its way upward displacing the rock above it. Please take time to browse Photo Album 021: Arches and Canyonlands Nat'l Parks for more photos and information about Canyonlands. From Island in the Sky, we went a few miles down the highway to Arches National Park.. Arches National Park contains one of the largest concentrations of natural arches in the world. There are over 2,000 documented arches ranging in size from 3 ft. (the minimum size to be considered an arch) to Landscape Arch, which measures about 300 feet long at the base. The park also contains numerous fins and spires. The photo below shows Balanced Rock. The rock itself weight an estimated 7 million pounds. There used to be a smaller balanced rock nearby called Chip off the Old Block, but it fell during the winter of 1975. An underlying salt bed is largely responsible for the formation of the fins and columns found at Arches National Park. The salt bed, which was unstable, caused shifting and buckling of the overlying stone causing vertical fractures. These vertical fractures made the formation of fins and columns possible. The arches generally form in a fin when freezing, wind, and other erosion forces cause pieces to fall out of the side of the fin. Sometimes, the upper part of the fin will be strong enough to form an arch. 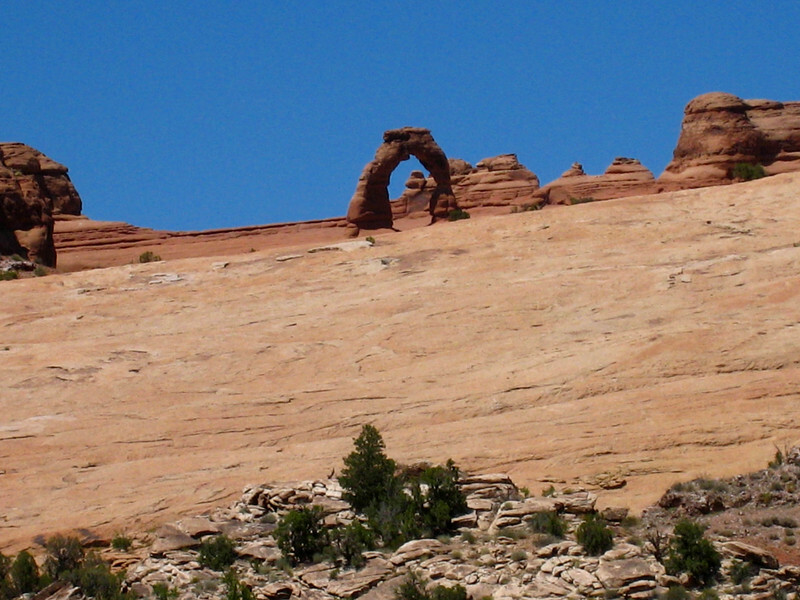 We were able to see a number of arch formations from scenic viewing areas or from very short walks from a parking area. 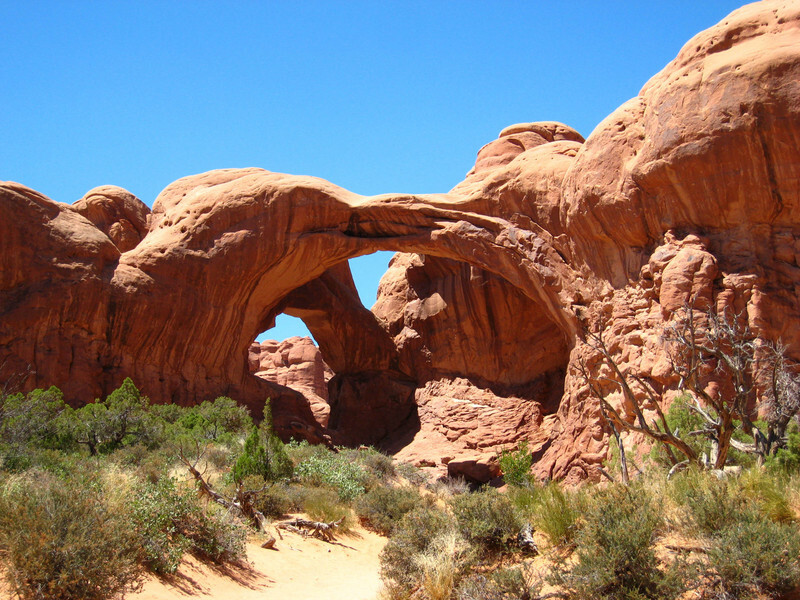 Double Arch, shown below, can be seen from the road. Or you can stop in a viewing area for a better look. From the viewing area parking lot you can also walk a few hundred yards up the trail and stand under the arch. The photo below was about 3/4 of the way up the trail. Delicate arch is a small, free-standing arch located on a rock slope. To view Delicate Arch, you have three options. You can go the the lower overlook (about 100 yds. from the parking lot, you can go to the upper overlook (about 1/4 mile from the parking lot), or you can hike right up to the arch (about 3 miles round trip). Because of Margery's knees, we chose the lower overlook and got the photo of Delicate Arch below. Landscape Arch, at a length of around 300 feet, is the park's largest and most spectacular arch. Not only is it the longest arch in the park, it is very thin. On Sept. 1, 1991, a 73-foot section of rock fell out from under the thinnest part of the span. On June 5, 1995, a 47-foot section fell from the front of the thinnest section followed by the fall of another 30-foot section on June 21. The thinnest section is now only 6 feet thick. Unfortunately, Landscape Arch can only be seen by walking a 1.6 mile loop trail. Since it was late in the day and we had already walked to a number of overlooks at both Canyonlands and Arches, that walk was just too far for Margery's knees and the trail was too rugged for her scooter. She was certainly disappointed. Maybe we will return to Arches some day and make that walk early in the morning with plenty of time for rest stops along the way. There are several additional photos of Arches National Park and more information in Photo Album 021: Arches and Canyonlands Nat'l Parks. 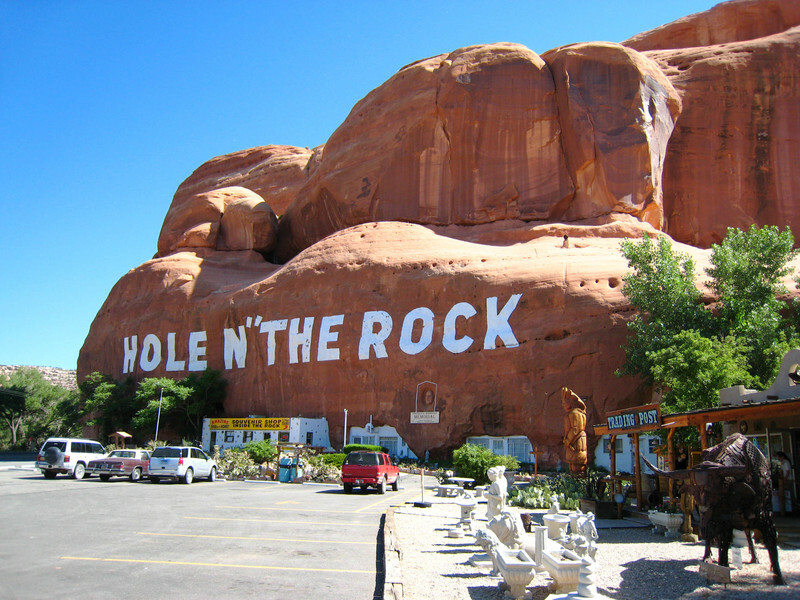 Just south of Moab is another interesting attraction called Hole N' the Rock. Some of you may have noticed the apostrophe should be on the left side of the letter "N" indicating it is a shortened form of the word "in." That would be the grammatically correct way of doing it, but the name was copyrighted as Hole N' The Rock with the apostrophe to the right, so that's the way it's written. Hole N' The Rock is a 5,000 sq. ft., 14-room home carved out of a solid red sandstone hillside. Back in the 1940s, Albert Christensen,with the help of his two brothers, blasted out a 5,000 sq. ft. space inside the sandstone cliff at the old family homestead. They opened a successful diner at Hole N' The Rock, but disagreements between the brothers led to the closing of the diner. Later, Albert met Gladys Davis, an old friend, whom he married. The couple moved back to Moab and reopened the diner in 1953. The white, rectangular building with the yellow sign is the former diner and current gift shop. It was disappointing that we were not allowed to take photos inside during the tour. 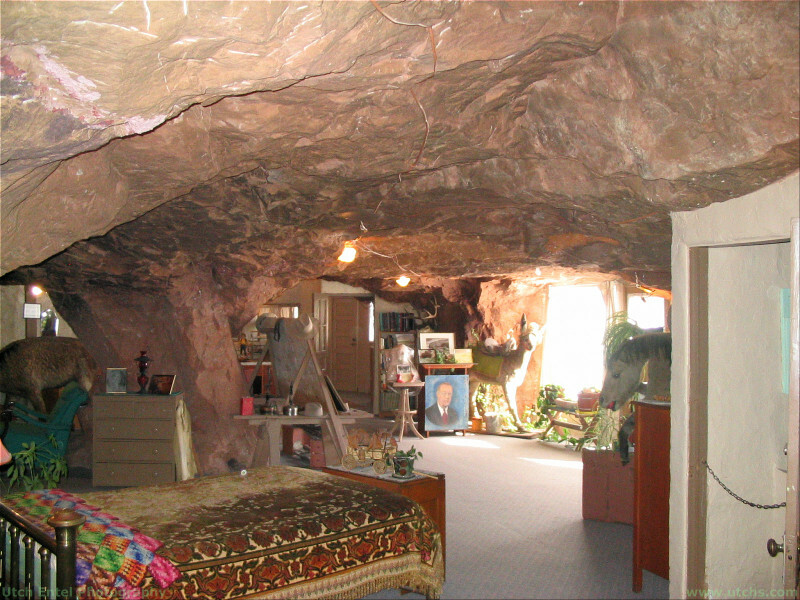 However, the following pictures of the inside of the ROCK are used with permission from Utch Entel Photography. In addition to being an artist and sculptor, Albert also dabbled in taxidermy. His first endeavor was to stuff his beloved pet donkey, Harry. The donkey's lips and nose were a bit crooked. What a hoot! Albert died suddenly when they had only been married five years. He is buried in a rock cove in the base of the dome which he carved himself for the purpose. 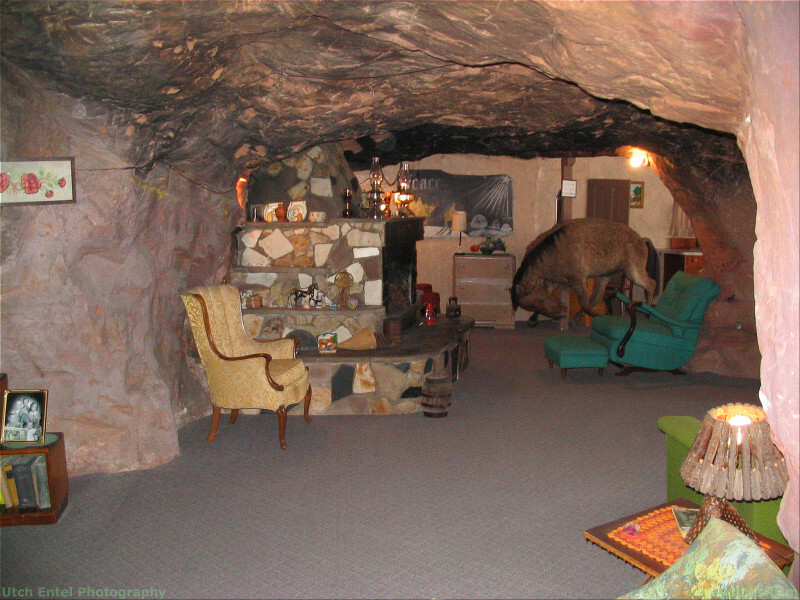 After Albert died, Gladys continued to live at Hole N' The Rock. The diner became a rock and gift shop, and Gladys gave tours of her home for 50 cents to help make ends meet. Gladys' son, Hub, recalls an embarrassing moment when he was visiting his mother and decided to sleep in. He awoke to find a surprised tour group starting at him. Here is the "master bedroom" where Hub was sleeping when awakened by the tourists. This is the living room. The stuffed specimen in the corner demonstrates Albert's improvement in taxidermy skills. 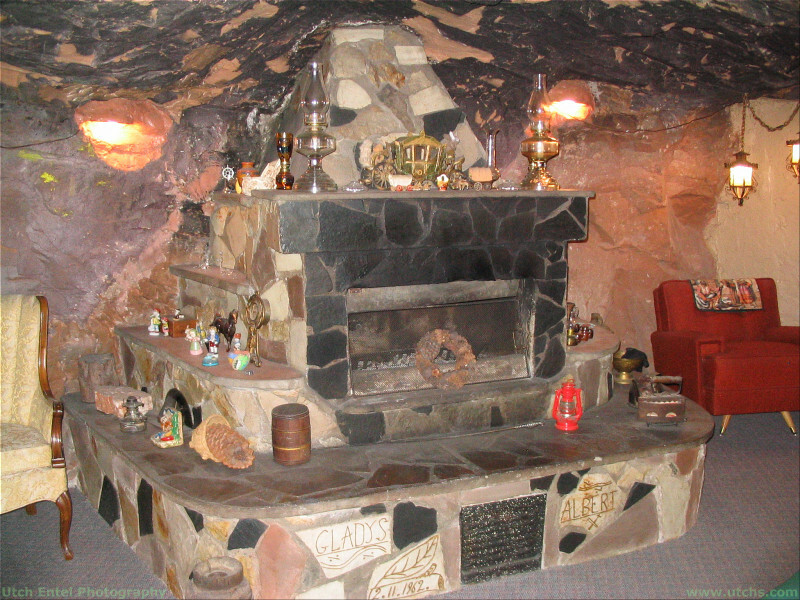 Although the HOLE has a constant temperature of 65-70 degrees, a blazing fire in this huge rock fireplace looks cozy on chilly days. Two 10-inch diameter holes drilled 60 feet down through a shelf on the rock formation for a fireplace vent were in the exact location to provide a workable chimney. Gladys did the artwork on the fireplace. 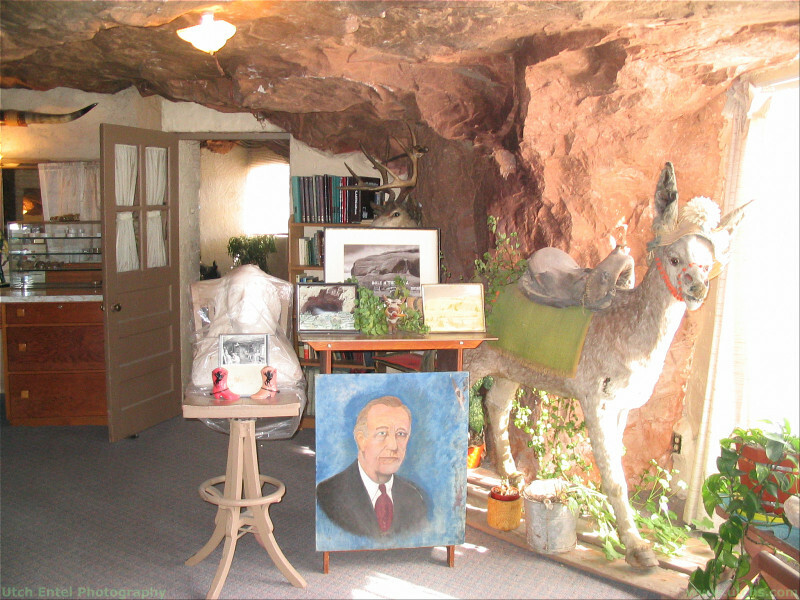 After Gladys' death, her son turned Hole N' The Rock into a tourist attraction. Everything in the HOLE is exactly as it was when Gladys was alive. Wow! We have really been doing a lot of sight-seeing lately. There was so much to see at each stop, especially in Utah, and we didn't allow enough time. We were out almost all day every day and we still didn't see everything we wanted to see. We had to move on because of campground reservations for our next stop. We don't like to make too many reservations and we don't like to make them too far in advance, but felt we needed to because of the approaching July 4th holiday and the summer tourist season in general. Oh well, guess we'll have to go back someday. We will be moving east to Colorado, and we are looking forward to staying a little longer in each location with a little less to do and see so we can catch up on laundry, grocery shopping, and relaxing. By the way, a story that Margery wrote about our full-time RVing experience has been released in a new book entitled ">"RV Freedom Now." It's a great book with lots of how-to tips to realize YOUR dream as well as stories from full-timers like us.